People who repeatedly view terrorist content online could face up to 15 years behind bars in a move designed to tighten the laws tackling radicalisation the home secretary, Amber Rudd, is to announce on Tuesday. A new maximum penalty of 15 years’ imprisonment will also apply to terrorists who publish information about members of the armed forces, police and intelligence services for the purposes of preparing acts of terrorism. Amber Rudd has outlined her intention to clamp down on violent and non-violent extremism, including antisemitism and neo-Nazism. The Home Secretary also told the Conservative Party conference in Manchester that social media companies must “act now, honour your moral obligations” to use new technology to stop radical material appearing on their platforms. You’re reading “extremism” right now. The Occidental Observer is an “extremist” website. In other words, it is a realistic website: it details in calm, rational and thoroughly sourced fashion the numerous ways in which, to paraphrase the late great Father Feeney, “the Jewish race constitutes a united anti-White bloc within White society, and is working for the overthrow of that society by every means at its disposal.” I don’t think that, at the moment, anyone would receive “15 years’ imprisonment” for reading the Occidental Observer, but Amber Rudd and her controllers certainly want to frighten people away from politically heterodox sites. And jail time for reading an article like this is certainly what Jewish activists like Moshe Kantor and Jeremy Newmark would like to see. They don’t want any discussion of Jewish power, because power that can’t be discussed is also power that can’t be challenged. Theresa May welcomed dozens of Jewish community leaders, volunteers and religious figures to Downing Street today for what was thought to be the first ever Rosh Hashanah reception held at Number 10. The Prime Minister said she wanted to thank British Jews, and show her “personal support and appreciation for everything that you contribute to our country”. 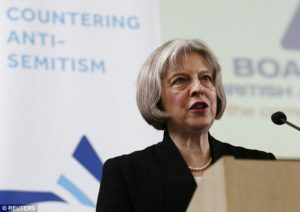 May also claimed that Jewish values are British values. 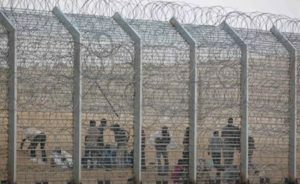 If that were true, Israel would have open borders and Jewish politicians would make grovelling speeches to Christians, smarmily insisting that “Christian values are Israeli values.” But Israel has sealed borders and politicians like Benjamin Netanyahu do not grovel to Christians or any other goyim. Instead, they keep goyim firmly in second place. Jewish values are unashamedly supremacist and designed to preserve and extend Jewish power. And just as May’s use of “philanthropist” has a special Jewish sense, so does her use of “hatred.” It doesn’t mean expressing hatred towards Jews, but expressing views that Jews hate. It goes without saying that nearly every one of these women—Rose McGowan, Ambra Batillana, Laura Madden, Ashley Judd, etc.—was a Gentile, all the better to feed Weinstein’s revenge-tinged fantasy of having risen above his outer-borough, bridge-and-tunnel Semitic origins. The article, written by Mark Oppenheimer, indirectly raises some very interesting questions about the consequences of Jewish power. For example, why do Jews like Roth and Weinstein feel “vengeful” towards Whites when they are part of the richest and most successful ethnic group in America? If it’s because Jews nurse historical grudges against Whites, how else is their vengefulness manifesting itself? 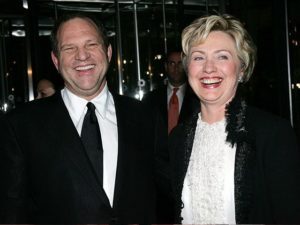 On one reading, Weinstein is a blatant hypocrite for supporting Hillary Clinton and the Democrat Party at the same time as he was molesting shiksas all over the world for decades. On another and more accurate reading, Weinstein’s crimes are entirely consistent with his politics. Liberal elitists like Weinstein and Clinton want power and wealth for themselves, not improved lives for ordinary women. That’s why liberal elitists like Weinstein and Clinton are so strongly in favour of mass immigration from the Third World. Immigration atomizes Western societies and introduces pathologies that justify authoritarian laws and the surveillance state. And authoritarian liberalism is what the Lebanese writer Nassim Taleb would call anti-fragile: the worse it works, the stronger it gets. After 9/11 demonstrated the incompetence of the surveillance state and the clear danger of mass immigration by Muslims, guess what? The NSA’s budget and Muslim immigration both increased. After mass killings by Muslim fanatics in Manchester and London, guess what? The British government has a further excuse to censor “far-right propaganda” that protests against the Muslim colonization of Britain. But Amber Rudd, the shabbos-shiksa who announced more censorship, wasn’t entirely lying when she made this claim: “The safer Britain I want to help build as Home Secretary is a united one.” She doesn’t want more safety, but she does want more unity. She wants Britain united in obedience to the Tribe. 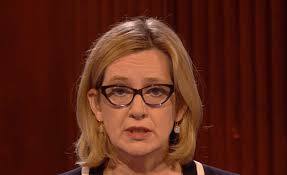 Traitors like Rudd serve Jewish interests and want everyone else to do the same. Ordinary Whites are expected to serve Jewish interests by becoming a dispossessed minority in their own nations. My response is simple: Non serviam — “I will not serve.” Thanks to sites like the Occidental Observer, more and more Whites are saying the same.